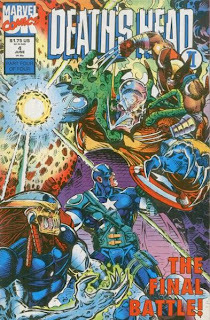 In 1992 I came across the forth, and final, part of a Marvel UK mini series. It took place in the far off year of...2020! It opened with Doctor Strange, Spider-Man, Daredevil and The Punisher doing battle against an army of zombies and some large seemingly unbeatable, time-traveling, monster. The four die, ending with Frank Castle taking on an unstoppable force with nothing but a knife, and we are lead through the story to other future heroes fighting against some future apocalypse (not the character). Captain America leads the last of a rag-tag resistance which includes Wolverine, Rhino, She Hulk and The Scarlet Witch. They travel back in time, meet up with Death's Head II (who killed the original Death's Head at some point), and fight the evil force from the beginning of the issue. At the end everyone from the future dies in battle except Death's Head II and the Scarlet Witch, who eventually fades away since the future heroes corrected their past; thus, the Scarlet Witch didn't exist anymore. The last page show's the present day Avengers arriving on the scene of the battle never knowing what long war was just avoided. I had no idea what had happened before the events of that last part of Death's Head II "The Wild Hunt," and I still do not. I have yet to go back and collect the first three books. At the time I just loved the idea of a future that was so bleak my favorite character Spider-Man died. Plus, the visuals of Daredevil dieing while fighting alongside the Punisher, Wolverine breaking a claw off on Death's Head II's gun-arm, and Mr. Fantastic in putty form floating in a huge sphere was mind blowing to me. I loved it! I didn't understand it. But I loved it. This year I vow to get those earlier Death's Head II issues! Like today's comic of the day, those 3 issues will be future comic of the day material. Because while today's comic of the day is the destination of the story, sometimes the journey is far more enjoyable...a journey which I have yet to complete in 18 years. You are reading Nova, right? DnA are picking up on these threads. Another Marvel UK highspot is Mystech Wars. Look for that when you back-issue dive for the Death's Head stuff.